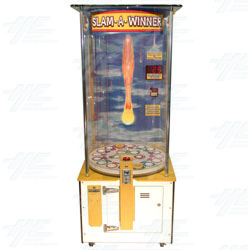 Slam-A-Winner is a ticket redemption machine from Benchmark Games that has a fun meteors-falling-from-the-sky theme, dynamic sound effects and an attractive, minimal floor-space cabinet design. Time it right so the ball falls through the bonus target, and win extra ball drops and/or mountains of tickets! Even if you miss the bonus hole on the first shot, the bouncing ball careens around the play area before dropping into a point hole... Pure Excitement! Hit the "Slam Button" and release a high energy ball, aiming at holes in the spinning horizontal wheel below!